Dorset Apple Cake (sometimes known as Somerset Apple Cake) is delicious served warm. 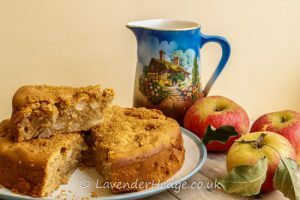 Although this recipe calls for cooking apples, but I find it a great way to use up any type of windfall apples. Heat the oven to 180°/160° fan/mark 4 gas. Grease and line a deep 20cm (8″) cake tin with baking parchment or cake tin liner. Cream together the sugar and butter until soft. Add the beaten eggs, a little at a time. Add the flour and enough of the milk to make a soft consistency. Place in the prepared tin and gently level surface. Sprinkle with the demerara sugar and bake in oven for 35-40mins or until golden and a skewer inserted into middle comes out clean. Allow to cool in tin for 15 minutes before turning out on a wire rack to cool further. Serve warm with a little cream or custard and enjoy!